Throughout history, skilled craftsmen helped shape the fate of mankind by constructing the most iconic weaponry known to man. Now, today's best weapons smiths are bringing the past to life in the ultimate historical weapons building competition. Inspired by age-old traditions, the series brings these craftspeople together to compete against one another building the armaments that changed the course of history. 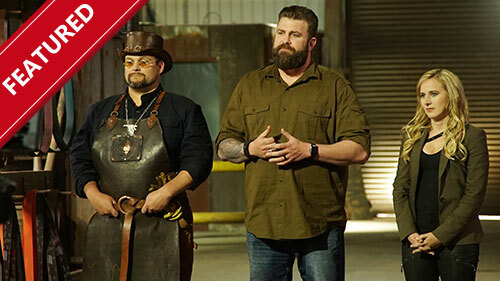 Each episode, three builders compete in two historical challenges that call upon era-specific weaponry, from the firearms of the frontier to the blades of the Vikings. This season, shop owner Ryan rebuilds the trust and morale among the crew, Van steps up as a leader by opening a retail shop and Charmaine returns as shop manager while her career as a radio personality and entrepreneur continues to blossom. Don spends more time with his new baby Ashdon and wife Ashley to concentrate on fatherhood and repair his relationship after a social media scandal, as Lily embraces the single life and provides for her mother and sisters after her father's passing. Newly engaged Danielle is looking to the future, but is trouble already brewing ahead of her impending nuptials? Phor questions his role in the 9 Mag rebrand and focuses on his music by touring the country with the support of his entrepreneur girlfriend Nikki. In the season premiere, Nanette Krentel is found burned to death in her own home. Her husband and local fire chief, Steven Krentel, is baffled by the accident that took everything he owned, including his true love. During Nanette's memorial service, news is released that Nanette's cause of death was not by the fire. She was shot in the head. An investigation into the lives of Nanette and Steven uncover secrets, lies and deceit while arson experts unravel the story of a fire intentionally set to burn any evidence of a killer. Melanie Walker, one of South Africa's most passionate landscape enthusiasts, once again joins forces with food gardener extraordinaire Linda Galvad in a fresh season of Gardening 101. Melanie takes us through more of the country's most impressive gardens, from private homes to public spaces and botanical wonders, digging deeper into the world of horticulture and sharing ideas and tips that you can use in your own garden. Linda brings us more of the advice we need to create bountiful vegetable gardens which will be the envy of the neighbourhood. From preparing and planting right through the care and harvesting your fruitful crop.